At Amazon's 2014 re:invent conference in Las Vegas, they announced CodeDeploy, a tool designed to simplify the process of deploying applications to groups of servers, sometimes numbering in the hundreds. 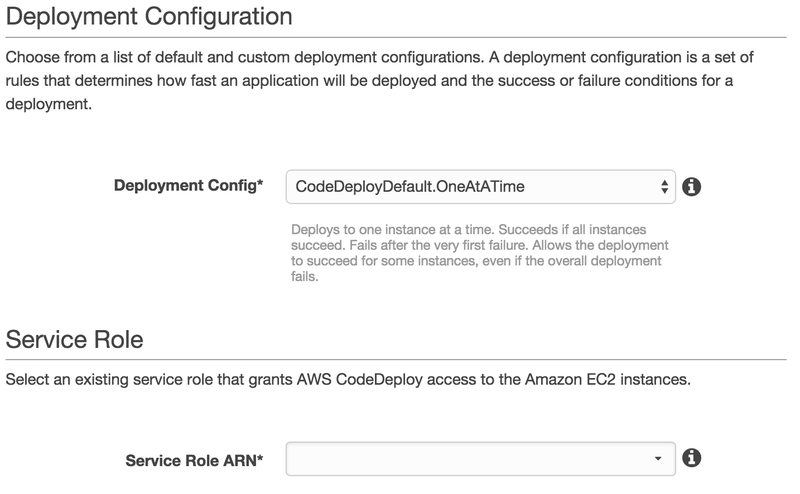 The primary objective of CodeDeploy is to make deployments consistent, repeatable, and integrated with existing AWS services (you can complain about vendor lock-in now, but AWS is doing a great job of providing value for that lock-in). I took a few hours to setup CodeDeploy and documented issues I ran into. This post is a result of a few hours of playing with the service and trying to get it running on a Ubuntu 12.04 Server (despite 14.04 being the only "officially" supported version. 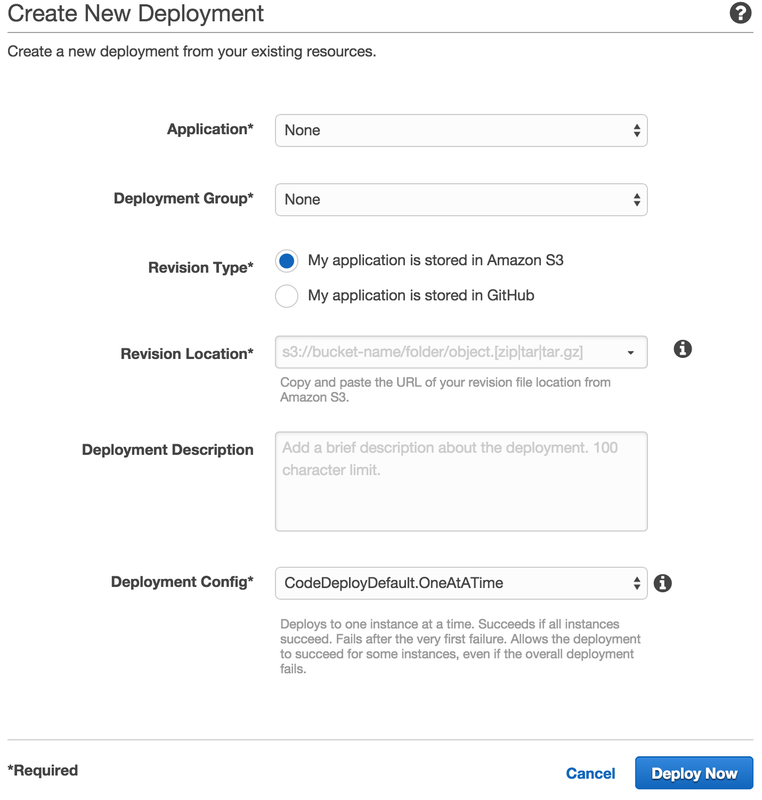 At first glance, CodeDeploy really seems like a game changer; it's built by Amazon, integrated with their services, and a convenient way to do rolling, all-at-once, or grouped deployments. Once I started working with CodeDeploy, it felt like a solid product once I got past the first few issues. Of course, given its recent release, it also lacks a lot of support or online discussion, which left me manually digging through error logs and support forums for dependencies. While the documentation is pretty decent, there are currently only about thirty questions in the AWS forums about CodeDeploy. The biggest issue I found was that I had to manually add an alternative source for ruby2.0 on Ubuntu 12.04 and install it myself before continuing - but this was not the fault of CodeDeploy. This allows CodeDeploy to access the tags and autoscaling groups it needs to in order to create applications and deployment configurations. Next, I created the instance IAM role. It is important to remember that the CodeDeploy service needs access to the autoscaling and EC2 resources listed above while the instance itself only needs access to the S3 bucket containing the CodeDeploy agent and whatever bucket you store your final compressed file in. Here's a good place to tell you what I did wrong. Being security conscious, I thought I could get away with giving the instance role GetObject permissions only. My existing deployment strategy only requires this permission to pull the file from S3. However, apparently CodeDeploy tries to list the file and its ACL before downloading, which results in an error without the additional permissions. Lesson learned. The next step was to get the agent installed on the Ubuntu Server instance. Amazon provides its own "Amazon Linux" if you're looking for an officially AWS-supported AMI, but I'm much more familiar with Debian-based distros, so I chose to stick with that. 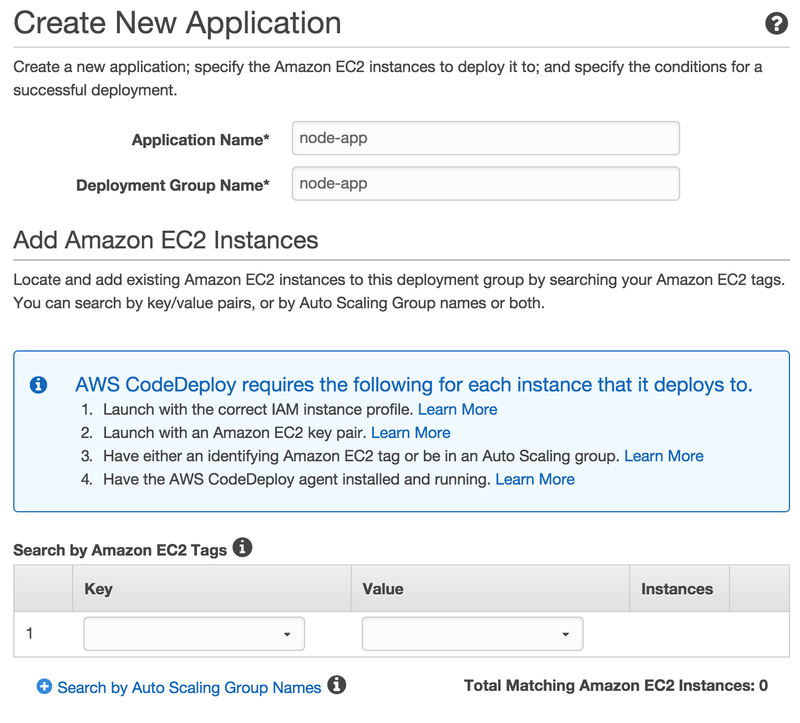 When you launch your instance, make sure you either give it a descriptive tag or place it in an autos-scaling group. There is a yet-unanswered forum post about this here. Finally, I ran the install script yet again and it worked! The application I wanted to deploy was a simple Node.js web app. It runs on the server using "forever," a daemon that keeps the process running in the background. To prepare it for CodeDeploy, I had to add an appspec.yml file and two scripts: a start and stop script. Keep in mind that the YAML file is super-particular about spacing. There's an entire section devoted to it on the AWS docs. Like I said, super simple, but it works. The basic premise of this is that CodeDeploy will execute each file that you provide during the correct lifecycle event, as defined by the appspec file. Besides "AfterInstall" and "ApplicationStart," there are also "ApplicationStop," "BeforeInstall," and "ValidateService." AWS provides explanations here, but keep in mind that "Install" purely means copying files to the right directories. In my example, "AfterInstall" means that CodeDeploy will wait until the files have been copied before stopping the previous running instance. Once all of this has been done, create a compressed file of your choice (zip, tar, and tar.gz are supported on Linux, zips for Windows). Put the file in the same S3 bucket that you gave your instance permissions to earlier. Within the AWS console, you can now setup your application. To do this, head to the CodeDeploy page and create a new application. Provide a name and a deployment group name. The console doesn't make this clear, but the difference is that you can have multiple deployment groups belonging to an application. For example, you could have an app called "node-app" and create a "node-app-a" deployment group and then later create a "node-app-b" group which would help with A-B style deployments. In the tags section, enter either the autoscaling group or the tags you created earlier. If everything is successful, you should see the instance count increase. The next section, Deployment Configuration, allows you to determine how you want your apps deployed. This is not really relevant when you only have one server, but it becomes very helpful if you have multiple servers. If you choose "one at a time," AWS will go to each server, attempt to deploy your app, and stop if any servers fail along the way. With all at once or half at a time, CodeDeploy will run in parallel accordingly. This is a much faster, but also much more dangerous option. The service role should be the role created earlier with the necessary permissions. This role can be re-used for every application, as the permissions are the same regardless. Finally, the application can be created. The next page is a bit confusing because it does not contain any action buttons. Instead, it says to use the command line to upload an application. Instead of doing that, head back to the main CodeDeploy page and click on "Deployments." On this page, select your application from the list, then select the group name, paste the full S3 URL to your source into the box, and select your deployment method. Then, click deploy. You can then see the results of the deployment. This message really didn't tell me what was happening, but after logging into the instances, going to the /opt/codedeploy-agent/deployment-root directory and finding that all of the source files contained an XML error from S3 instead of the actual files, I was able to debug it. Be sure that you use all of the permissions listed above for the instance role or you might run into the same problems. Besides deploying from an S3 object, you can also tie into GitHub. While this could work, I prefer to have a 100% working source file before actually deploying to an instance. I still use Jenkins to pull my changes from GitHub, install dependencies (node modules for my apps), run tests, zip everything up, and put it on S3. Once that's done, I can launch a new deployment from the console, or even have Jenkins use the AWS CLI to launch a deployment pointed at the file it just uploaded. While I could certainly install node modules as part of the pre-install hooks on the instance itself, that is much more error prone and slower as well. UPDATE: AWS has also informed me that there is an open-source Jenkins CodeDeploy plugin available. I've installed the plugin and it works quite nicely; you can easily specify the application name, deployment group, and deployment policy from within Jenkins. Then, it executes as a build step with the same exit codes as Jenkins. Essentially, you can push to GitHub, copy to Jenkins, run tests, then execute a CodeDeploy deployment all as a result of one push (assuming you have the appropriate webhooks). Overall, CodeDeploy worked very well once I got it working. I was able to deploy my app multiple times in a row without issues and even tested out the "one at a time" feature with an autoscaling group. Everything worked as expected. While I don't think CodeDeploy will be a complete replacement for a tool like Jenkins or other CI suites, it does remove the last few steps and make them more tightly integrated to AWS. I highly reccommend you try CodeDeploy out, but definitely do it in a test environment first until you have the process down to a science.